Miami Beach 411 > Guide > History of Miami > ¿Hablas Español? Learn about the different architectural styles in the South Beach Art Deco District. And like many events that changed the course of history, the Marilel Boatlift began with a single act of dissidence. "Who exactly is “Dade?” Was he a great explorer? Or perhaps an heroic military leader? It is hard to believe there was a time when only one language was heard in Dade County government offices. It was as recently as 1993. The shooting of famed fashion designer Gianni Versace is perhaps the most visible and memorable homicide in Miami Beach history. Between the cocaine-crazed 80's and the real-estate crazed 21st century there were those transitional 90's. One of the best things I’ve done in my life is to take Dr. Paul George’s Miami and South Florida history course at Miami Dade College. Learn about John Collins, Carl Fisher, and Morris Lapidus. Historic Dates in Florida's history. 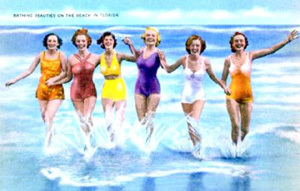 Miami Beach History learn about the history of South Beach.